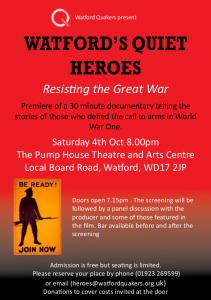 Watford’s Quiet Heroes is a 30 minute documentary telling the stories of some of those who defied the call to arms in World War One. The bravery, hardship, sacrifice and sorrow of the combatants in WW1 are rightly remembered during the centenary. The impact on families and communities at home is also coming alive in re-discovered personal stories and many centenary projects and events. There has been less attention to those who refused the call to arms and the consequences they had to face. The challenge presented by this very small minority is as relevant today as it was then. Our film is about three of them. 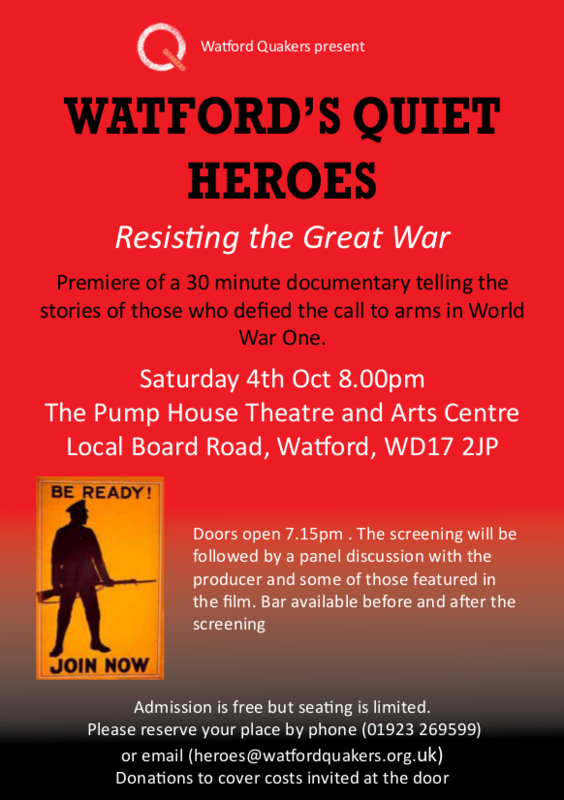 The film has been shown at two public screenings in Watford, first at the Pump House Theatre, and then at Watford Museum. Both were very well-attended and included lively post-screening discussions on the relevance of war resistance in the UK today. The production team are also offering workshops based on the film to local schools and other groups. Please get in touch if you are interested in hosting one. David Lloyd George, Secretary of State for War, 26th July 1916.